COLORADO SPRINGS — U.S. Air Force Secretary Heather Wilson on April 9 shot back at the Space Development Agency and its director Fred Kennedy, who is laying out a plan to disrupt the military space business by bringing more commercial technology into space systems to speed up innovation in the face of competition from China and Russia. The SDA was created only a month ago and its first project will be to design a constellation of low-cost satellites in low Earth orbit that would leverage commercial spacecraft adapted for military missions. 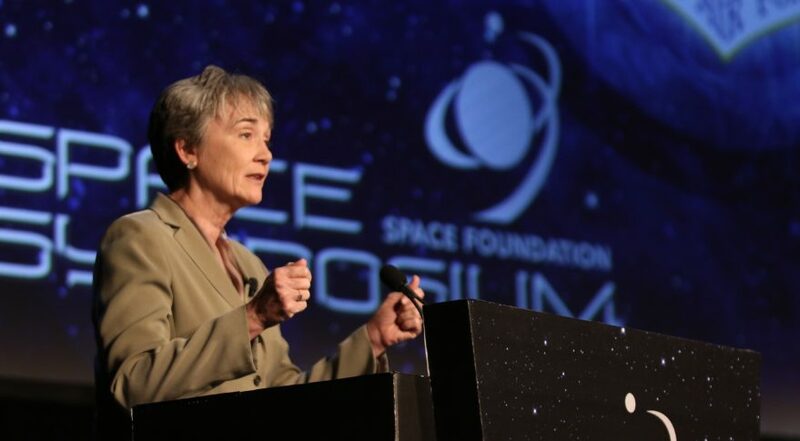 In a keynote speech at the 35th Space Symposium, Wilson challenged that vision, arguing that the military’s current constellations of satellites in higher orbits are “the best in the world” and that shifting to LEO systems would put U.S. forces at risk. Wilson cited a 90-day “Space Strategy Study” recently completed by the Air Force and the intelligence community that concludes that LEO-based systems would be vulnerable during military conflicts and that DoD should not be taking that risk. Kennedy told SpaceNews April 8 that the SDA’s proposal to leverage commercial LEO constellations — and the manufacturing capacity behind them — is aimed at reducing the vulnerability of current U.S. systems. “If I can build spacecraft for a million dollars or less, if I can pull them off the production lines and use them, I can now afford to lose things. I’m not scared anymore. I can put up several hundred satellites and know that maybe 75 percent of them will work and that would be just fine,” he said. Wilson argued that such a plan might work for some scenarios but would be reckless to apply across the board in military space systems. The Air Force’s 90-day study was kicked off in late 2018, just as the Pentagon was putting final touches on a plan to stand up the SDA. Acting Defense Secretary Patrick Shanahan has been a strong proponent of the new agency and decided to place it under the authority of Undersecretary of Defense Mike Griffin, who like Kennedy, is a staunch believer that military space acquisitions must change radically and that commercial LEO systems should be leveraged as soon as possible. “Increasing the number of satellites helps but numbers alone are not enough,” she said. The Air Force already has moved to transition to commercial systems in areas like satellite communications, she said. This would drive all the services toward low-cost multi-band satellite communications terminals, a change that Kennedy also advocates. Wilson said the study found that space missions “that are not well aligned with commercial LEO satellites are better off staying where they are, or making changes to protect themselves.” Kennedy, in contrast, thinks LEO constellations have a role to play in all military missions.